Disce puer latinae! – Learn Latin, lad! These were the words heard by the Kraków students who had difficulties in learning the language of Ovid and Cicero. In this case the lack of language flair was not an extenuating circumstance. The ability to speak Latin was the basis for functioning at the church and secular offices almost till the 19th century. One had to be familiar with Latin – end of discussion. When one reads city documents of the 17th or 18th century, one notices with astonishment that they comprise a strange mixture of Polish and Latin words. No wonder that modern Polish abounds in words of Latin origin, such as the commonly used words like honour, patriotism, machine or table. In this way Pucheroki moved outside of Kraków. In the 19th century this custom flourished at the villages in Kraków, but the role of students was assumed by the village boys. At that time the ‘obligatory’ outfit of pucheroki developed consisting of a high rolled-up hat made of straw and then more frequently of cardboard, often adorned with ribbons or tissue paper strips, and sheepskin jackets tied with straw plaits. The face had to be covered with soot, particularly where the beard and moustache were to grow in a few years. Another vital attribute was a basket, similar to those used for blessed Easter food only bigger, and a cane decorated with tissue paper. Today such outfit can be seen in the Ethnographic Museum in Kraków. One can also admire it on a live person on Palm Sunday, but only in a few villages. Practically only in Zielonki and Bibice the custom is observed with full attention to detail. Pucheroki start with orations early in the morning, travelling from one village to another and collecting donations in kind, mainly eggs that are often given in the form of Easter eggs. This dying custom is supported by the communal culture centres that organise competitions for the most beautiful outfit of pucheroki. 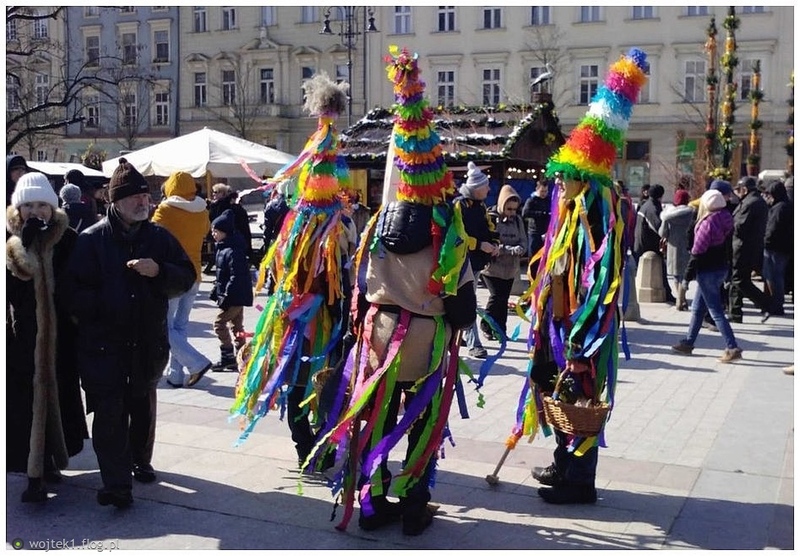 Maybe in the future the patronage over this tradition should be assumed by the Jagiellonian University? However one may look at it, it is a university tradition. Again, great stuff, keep it up, you do a great job.